With nervous anticipation I left San Francisco with my son and a one way ticket on August 15, 2011 to join the rest of my family in Finland. Today marks the one year anniversary of my move from San Francisco, California to Finland. What a year it has been! I cannot even imagine all that has happened during the last year, it feels like 5 years were packed into one. When I left San Francisco, I had ditched most of my material possessions, except for a few of my favorite items including my trusty road and mountain bikes. Would Finland wait for me with open arms? It would be a year of many adventures, ups, downs and cultural learnings. It is definitely a year that I will cherish for the rest of my life and will never forget. When I arrived in mid August, I was still working for a US company and worked remotely from home. This "work from home" job situation would last till the end of the year. During the later months of 2011 as the rain started to pour down and darkness reared it's ugly head, I was officially introduced to my first Finnish winter. Would I survive having heard so many horror stories about the cold, ice and darkness? I used several survival tactics which I wrote about in an earlier article on my blog. I took the winter head on, by spending time outside the house cross country skiing, swimming and working out in the city gyms and writing my blog. I absolutely was not going to spend my time locked up in the house, depressed, staring outside into the darkness. Trips were plentiful this year and first one included a visit to Stuttgart, Germany to see a friend and the Alsace region in France. Later in 2011 a family trip to see Santa Claus in Rovaniemi, Finland. Then in 2012 we went on several more trips taking full advantage of the convenience of living in Europe. Trips included a beautiful "kids-free" weekend getaway to Paris, France in the Spring. Later when the summer finally arrived, trips included St. Petersburg, Russia, Sweden, Norway and Barcelona, Spain. I have stated in my blog before, even though it has been a wonderful and rewarding year in Finland, it is nice to take advantage of the convenient flights and go on some adventures elsewhere. I hope to continue to be able to see more of Europe and the world using Helsinki as a base. The summer, even though a bit cooler than previous Finnish summers, (so I was told by many people) was still magical. People were relaxed and the downtown work life was much slower than normal. The BBQs started to pop up and everyone just had a better outlook on life it seemed. I even recall one night riding my mountain bike home at 3:00am and it was kind of bright outside because of the midnight sun and while riding through the forest, I had reached a total peace of mind. The summers are great, just wish they were a bit longer and less wet. It seems that when August rolls around people are already talking about autumn season. In California, August and September are clearly summer months and October kicks off the autumn season. I am keeping my fingers crossed because it looks like the summer has returned to Finland during this mid-August week. The past year has been a transition from working for a US based corporate company to working for a Finnish start up company. I have been very enthused about the opportunity to work for a Finnish company, because I think to fully absorb and integrate into the society it is better to work for a local company. I am still learning how the Finns do things and there are some slight cultural nuances that are different in Finnish leadership and management style. I am here to observe and learn from the differences, not complain about them. Though I do feel that it does definitely take a long time to gain full trust from a Finn, once that trust is gained, you will probably have a friend for life (so they say). That applies to co-workers and friends. 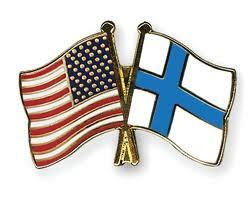 I have already written many entries in my blog about the differences between living in the United States versus living in Finland. Of course there is no perfect society and I have some complaints about how Finns do things and how they never seem to want to bend rules, but I also respect their policies and the secure and safe society. The key to learning to live in a new country is to acknowledge the differences and accept them for what they are. Basically, when in Rome, do as the Romans do. You should never move to a foreign country and live inside a little "bubble". Try to practice the local customs, get involved, and try your best to assimilate into the society. Even learn the language if you feel it is necessary, but good luck with that if you live in Finland. :) The first year in Finland has been highly rewarding, I have no regrets and can only hope the next year abroad goes as well as the last. congrats on surviving year #1 abroad! unless one has lived abroad, they have no idea what a big deal this is. and the best thing about for me was that after like 9 months in, i started to feel NOT like a foreigner anymore. it was insane how you can just completely adjust your lifestyle to your new home. im sure you've done the same :) cheers to year #2! Congrats! But to be honest it's hard not to live in a bubble when one lacks mastery of the language. You're forever a foreigner, in contrast to what happens when non-native English speakers move to an English-speaking country and slot in after a year or two. I definitely agree with not living in a bubble, even though it is very hard sometimes and you just want to scream "why don't you do things like normal people do" :D , but it so eye-opening and rewarding in the end. I've lived in Ireland for a bit over 2 years now and I do wonder about some of the people, who are from... let's just say other European countries, come here and surround themselves with people from their own culture and almost get mad at the Irish for being Irish. I don't understand how someone can expect people to adjust to their culture when they're the ones who packed up their belongings and wanted to come. Something caught my eye in this post though. Did you post about your trip to Rovaniemi, and did I miss it? I would be very interested to read what you thought, since it's my home town. Thanks, everyone! Katri - I didn't post about Rovaniemi. I visited Rovaniemi at the end of Novemeber, but started my blog in December. It was an interesting city and I really enjoyed the Arctic Museum. I wasn't as fond on the Santa Village and Santa Park because I thought they were over touristy. I also had a hard time with the very short days being so high North. Did you know someone named Karita Pusa? She was also from Rovaniemi and married an American friend of mine. I wish I had found your blog a little earlier! Interesting to see the experiences of another expat like me and our Finland tenure appears to have overlapped by about a year. My first year I lived alone in Turku while my wife stayed in the US because our kid was finishing senior year in HS. That was a lonely but strangely fulfulling experience and a time during which I began to love this strange northern place and its people. Good luck Suomessa! Ja nahdaan blogissa!